Siblings share a special bond. 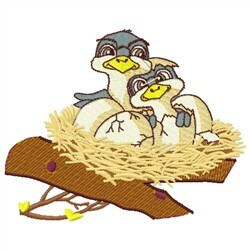 Show off that bond with this design of hatchlings in a nest. Great on wall hangings, blankets, and cushions. Embroidery Stitches is happy to present Birds In A Nest machine embroidery design which has 28979 stitches and is [124.71 mm x 99.31 mm] large. If you would like to view more embroidery patterns please search on our embroidery designs page.